From the Carver side(Routes 58 and 495), people come into the park via Cranberry Road (follow the signs taking Route 58 north from Route 495 Exit 2 (Carver) for 2.3 miles. Route 58 turns left but you continue straight on Federal Furnace Road /Tremont Road and then turn right onto Cranberry Road after another 3/4 mile. Follow Cranberry Road for 2 miles to the forest headquarters. There is also another entrance from Summer Street in downtown Plymouth. Find a left onto Billington Street a little west from the John Carver Inn. Billington Street passes under Route 3 and then becomes Watercourse Road (at the MSSF map's edge) before becoming Rocky Pond Road at the forest boundary and then becoming Bare Hill Road right after Rocky Pond and eventually runs into Lower College Pond Road, which takes you to headquarters. It sounds complicated but it's really just one road all the way in from Summer Street. In June 2016, a beautiful new Myles Standish State Forest map became available (free) at headquarters. The Charge Pond Loop-- A five mile loop that circles the Charge Pond campgrounds. Pine Barrens Path- An 8 mile trail running south from the Friends Trail all the way to Sasemine Road (off Charge Pond Road). The 15 miles of newly repaired and patched paved bike trails in the forest are also clearly shown. Major repairs were completed in 2015 on the west side trails and in 2016 on the east side trails. Download a printable PDF version of the map. It is a lot to take in in one map. 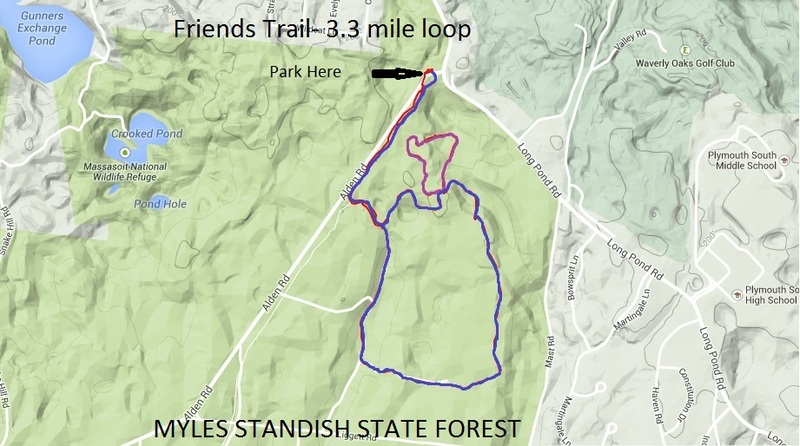 Myles Standish State Forest is larger than many Massachusetts towns but it is criss-crossed by a grid of north-south and east-west running forest roads which make figuring out where you are fairly easy. All of the intersections are now marked with red street signs, meaning that when you find one of these paved or dirt roads, you will soon be able to figure out where you are. Wooden signs at intersections throughout the park direct you to main locations, including headquarters, the Plymouth exit, the campgrounds at Charge Pond, Fearing Pond, Curlew Pond or Barrett Pond, the Boy Scout camps Camp Squanto and Camp Cachalot, etc. Here are a couple of scans of map sections to show you some of the detail. All campers have to visit forest headquarters to register. The park's interpretive center is located here. (Check the DCR event listings.) There are restroom facilities, open for much of the year. 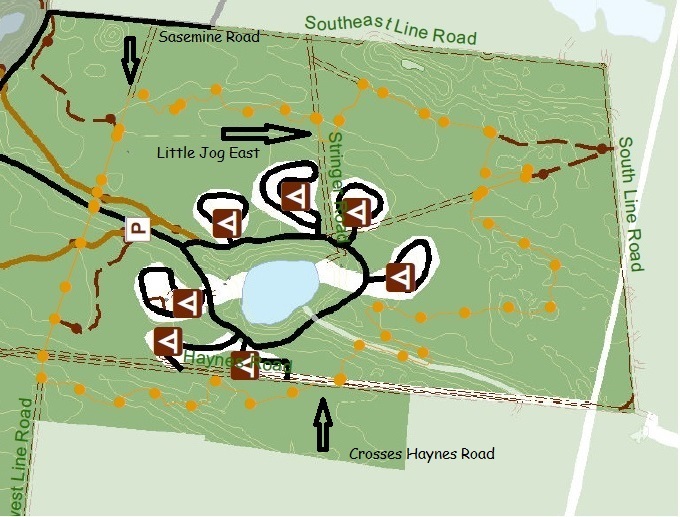 The East Head Reservoir Loop trail is shown (marked with green hearts on the map). Two main branches of the bike trails start at headquarters. The Barrett Pond campground is less than a mile from headquarters. The park's East Entrance from Long Pond Road in Plymouth is where most Plymouth residents would enter the park. There is a parking area (shown as P4 on the map) at the entrance. The Friends Loop and one branch of the bike paths start across the street from the parking area at the entrance. The northern section of the Pine Barrens Path is shown. It starts from the Friends Loop. All the roads it crosses (Liggett, Priscilla, Three Cornered Pond, Halfway Pond are dirt fire roads closed to autos). 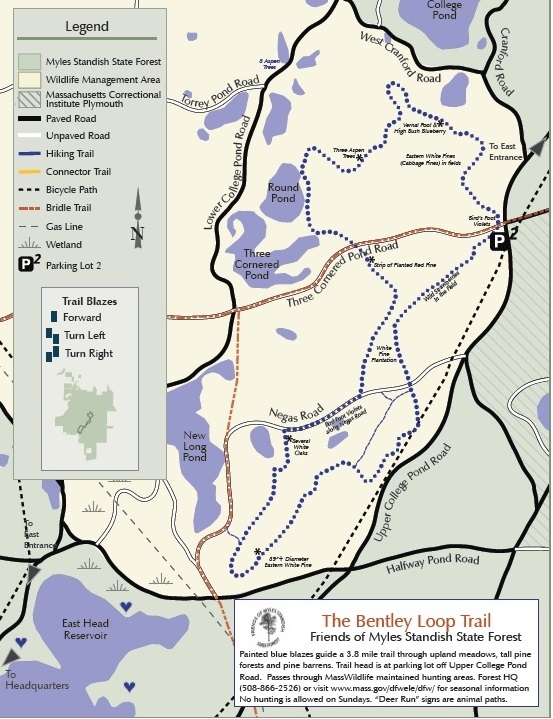 The Bentley Loop trail is shown. (center left, just below College Pond) This trail is very well marked and signed. Start at the parking lot off Upper College Pond Road (P2). Charge Pond (lower left) is the largest campground area in the park. About half of the "Charge Pond Loop" is shown. It circles the 7 camping areas at Charge Pond. Fearing Pond (just above Charge Pond) is shown. The two boy scout camps, Camp Squanto and Camp Cachalot, are shown on the lower right. (Although the camps are outside the border of the park, the camps are only reachable by car through the park.) Much of Camp Cachalot is open for hiking and other passive recreation because it sold a Wildlife Conservation Easement (WCE) to the Commonwealth in 1998 for $1 million. 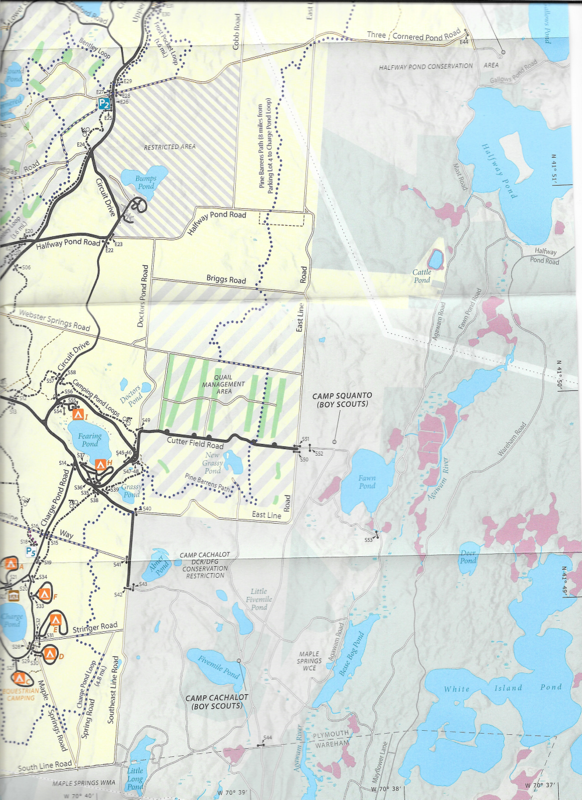 Map of the Cachalot easement from MassWildlife. (The area around Abner Pond in green is open to the public. The rest of the area in green requires visitors to register at the camp visitors' center (Car access is not allowed. You have to hike down the road to the main camp area.) The area in white is the camp buildings area and is not open to the public except during the two week shotgun hunting season in November/December.) 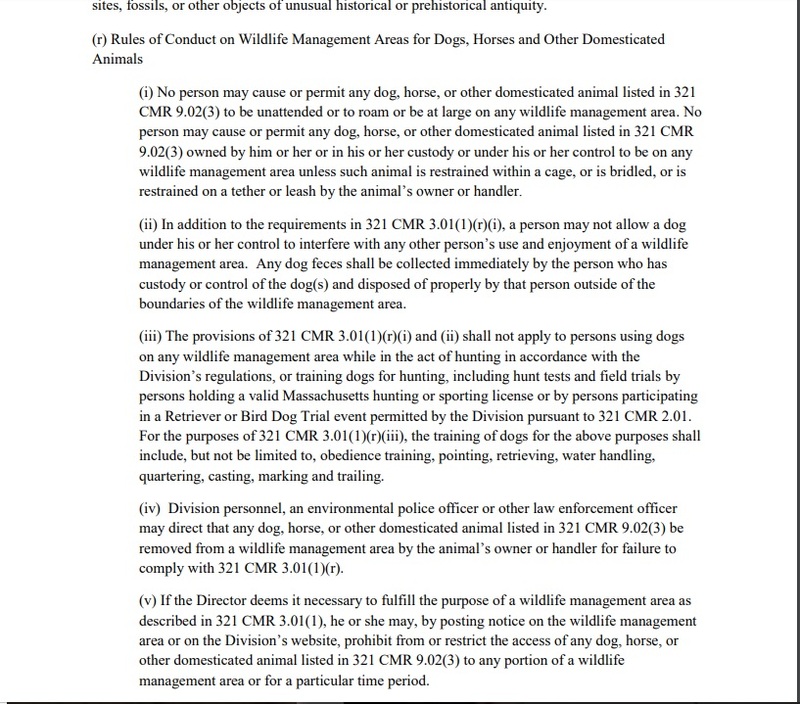 Read the full details of the Camp Cachalot easement. The camp remains private property but the public has the right to enjoy "passive" recreational access. 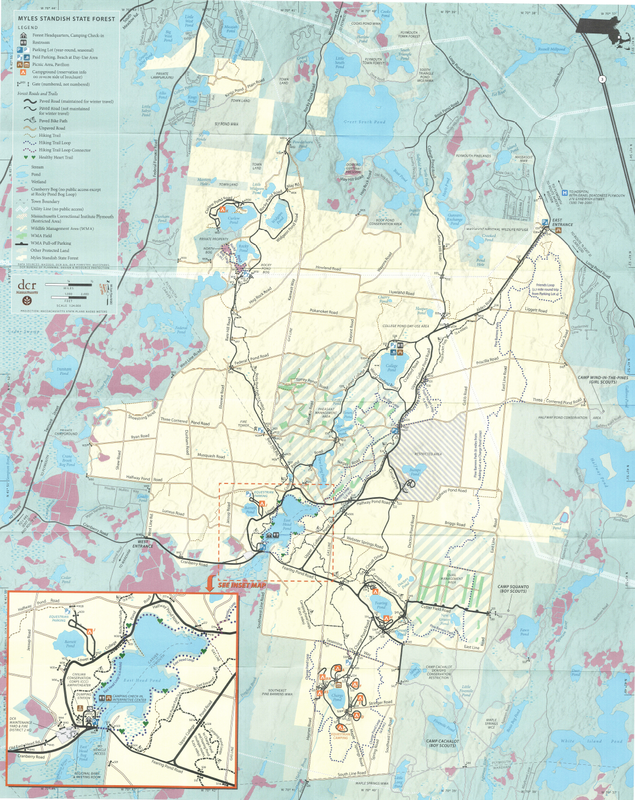 Also see: MassWildlife maps and information about access to conservation land in Massachusetts in Massachusetts. Camp Squanto has not sold an easement and is only visitable by permission. 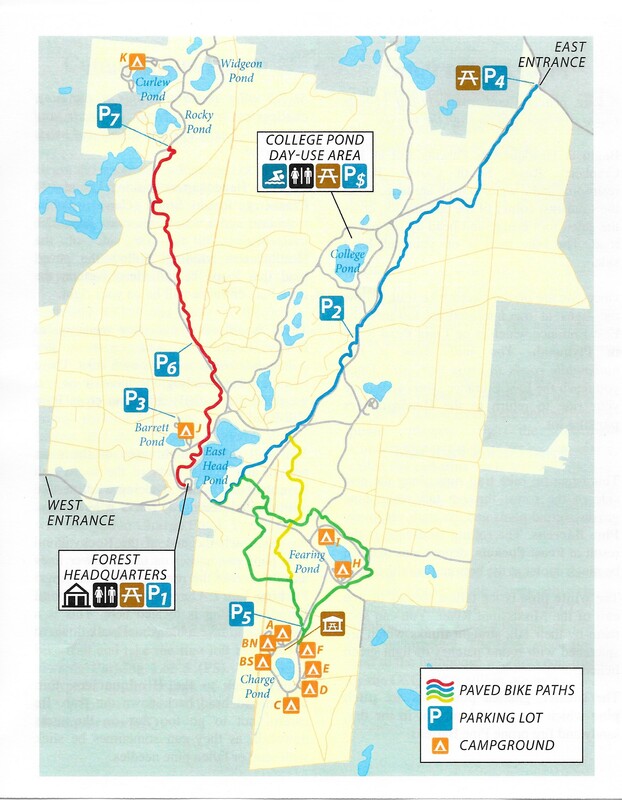 The east side bike trails, the "Frost Pocket Trail" shown in blue, are pretty flat and run all the way up from headquarters up to the park's east entrance on Long Pond Road. There are parking lots at either end and there is also a parking lot in the middle off Upper College Pond Road(It is called"P2") The east side trail feature signposts at various point directing riders back to HQ (headquarters), to P2 (parking lot 2 along Upper College Pond Road), and the P4, the park's lot at the entrance off Long Pond Road. To get to the start of the east side trails from headquarters, follow the signs from the parking lot past the barriers that block off Fearing Pond Road. Pass the entrance to the East Head Reservoir loop trail. Continue for several hundred yards to the bike path start on the left. Headquarters is 5 miles from the park's East Entrance along the bike trails. 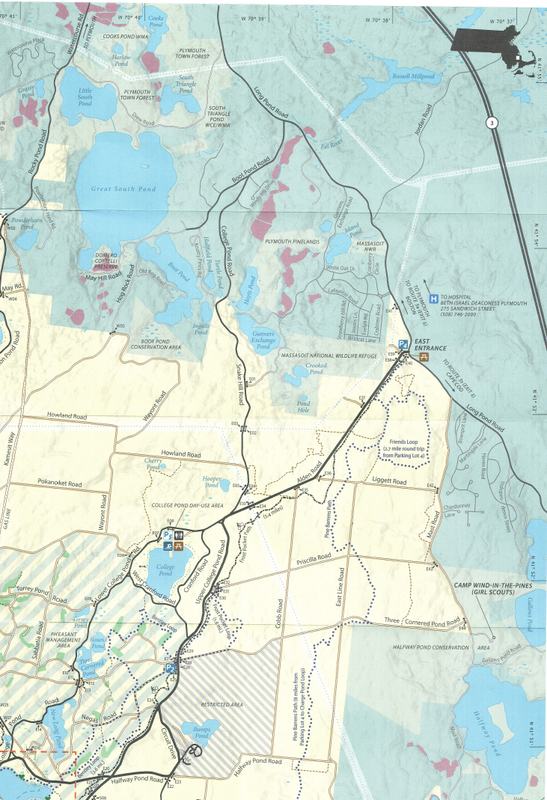 The west side trail, shown in red on the bike trails map, is about 4 miles long and runs up to the Rocky Pond Bog parking area along Bare Hill Road. A major resurfacing was completed in 2015, patching all the cracks and covering several areas where the trail crossed fire roads and a gas line easement. Because of the hills and winding paths, hybrid bikes or mountain bikes with low gears and shocks may be more comfortable to ride than road racing bikes. Find the west side trail's start near the forest amphitheatre behind the headquarters building. There is also another parking lot at the trail end near the Rocky Pond bogs. 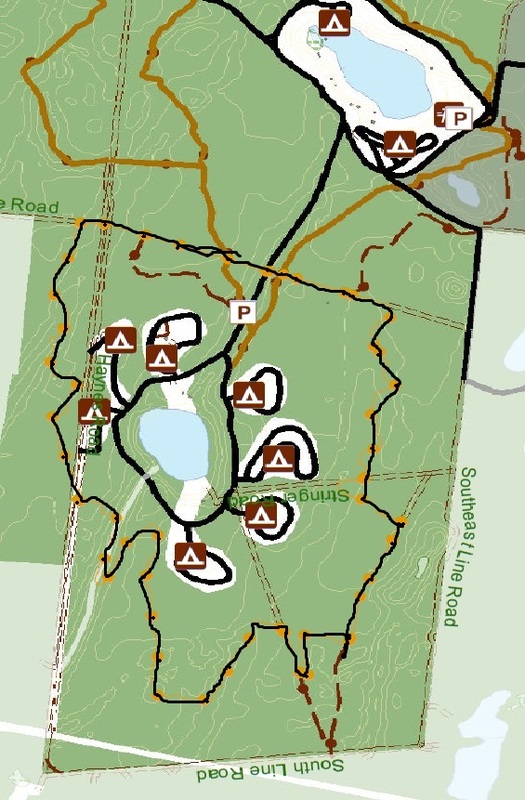 A branch off the east side trails, the "Campgrounds loop", shown in green, circles Fearing Pond (and its campgrounds) and also runs close to the Charge Pond Campground. (There is a parking lot along Charge Pond Road, shown as "P5" on the map.) The intersection with the East Side trail can be a little confusing for first time riders, but there are a lot of signs helping to make things easier. Orphan connector trails are shown in yellow. They offer a shortcut between the east side trail and the parking lot along Charge Pond road. The 2.5 mile Healthy Heart Trail circling East Head Reservoir is an ideal introduction to the area. 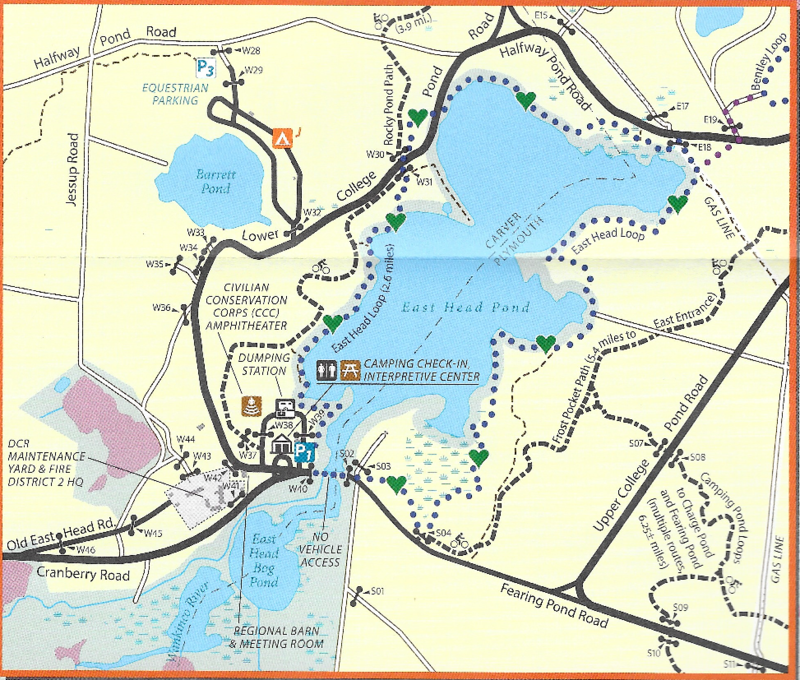 Shown by the little hearts on the zoom of the DCR park map, the East Head Reservoir trail hugs the shoreline of the East Head Reservoir for most of its length. In the springtime, the loop traverses a forest "teeming with pink lady's slippers and ringing with the oft-repeated call of common yellowthroats" . The trailhead is located near the forest headquarters. Park in the lot on Cranberry Road at the headquarters. 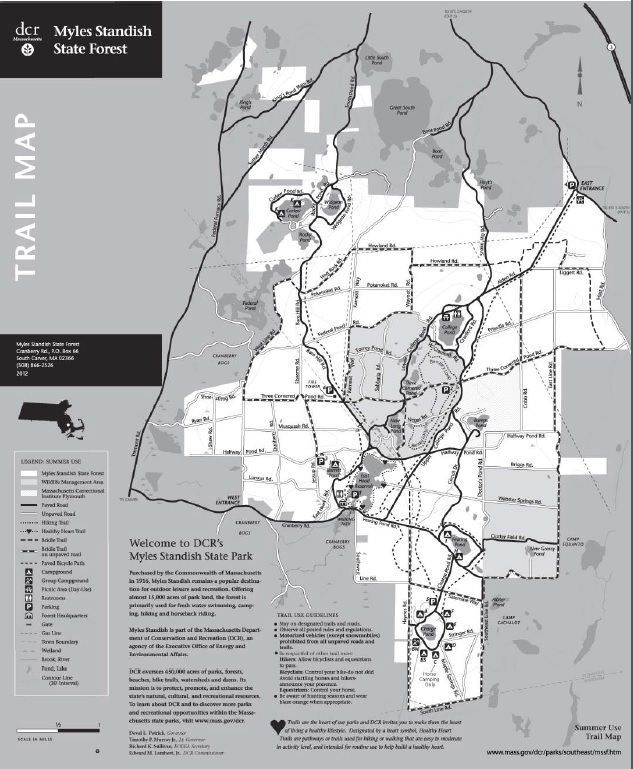 A self-guided nature trail flyer are available online or at the park headquarters. For more adventurous hikers, the 3.7 mile "Bentley Loop" is highly recommended. 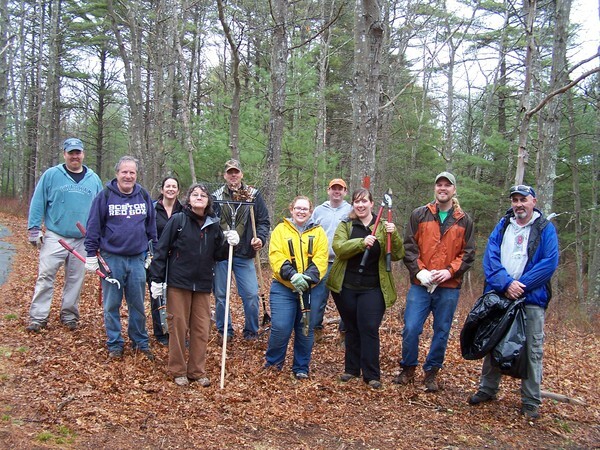 It starts from the State Forest's Hiking and Bike Trail parking lot off Upper College Pond Road. (Shown as parking lot #2 on the state maps.) It has been maintained for the last 30 years by one of our founding board members, Bob Bentley, together with help from his friends and from the Appalachian Mountain Club. 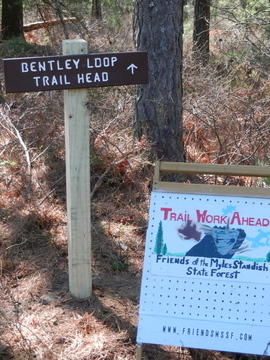 Hikers are reminded that Myles Standish State Forest is popular with hunters and that the area of the Bentley Loop is one of two in the forest stocked with game three times a week during the fall pheasant and quail seasons. 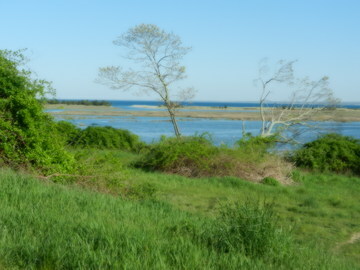 It is a Wildlife Management Area stocked by MassWildlife. Be sure to wear blaze orange clothing if you go out during the fall hunting season. Check the Division of Fish and Wildlife website for a full list of hunting season dates. (DFW map of pheasant and quail areas in MSSF) New regulations are being proposed by MassWildlife in February 2018 that will require all non-hunting dogs to be on leash in the area and will also require non-hunting dog owners to clean up after their animals. (See a larger size Friends trail GPS track.) We completely reset this trail in the spring of 2014. The loop itself is about 2.5 miles but starting from the East Entrance, the walk is about 3.3 miles if you include about four tenths of a mile along the bike path each way from the parking lot). The trail offers a number of excellent sections of majestic tall pines. The trail is typically hilly (a glacial moraine runs through the area) but would not be considered difficult by most standards. The trail was marked with blue painted blazes in 2014. The trail starts along the bike path and turns off into the woods about .4 miles from the bike path start at the park's East Entrance. Follow the blue blazes. A little half mile side loop is marked with purple blazes. Wooden signs are up at the major trail intersections. This five mile loop trail circles the campgrounds near Charge Pond. It has previously been known as the Neverending Trail. Easiest trail access is provided by the parking lot along Charge Pond Road (which is kept closed for most of the non-camping season.) Find the trail by taking a short walk north from the parking lot on the bike path and turning west (left) on Sasemine Road, the first dirt road you will come to. (The parking lot also provides easy access to the Myles Standish State Forest bike trails.) The rest of the year the trail can be reached via a half mile walk down Charge Pond Road from its closed gate to Sasemine Road. The trail runs east and west along Sasemine. The trail blazes are easier to find if you head west on Sasemine. This eight mile trail runs up the eastern side of the forest. 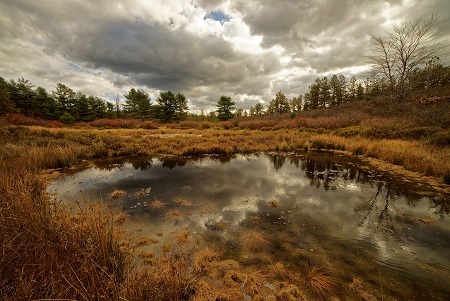 Much of the trail passes through classic pine barrens. It also passes through some tall white pine forests and some areas that were logged in 2015 because of the red pine scale (close to Priscilla Road). 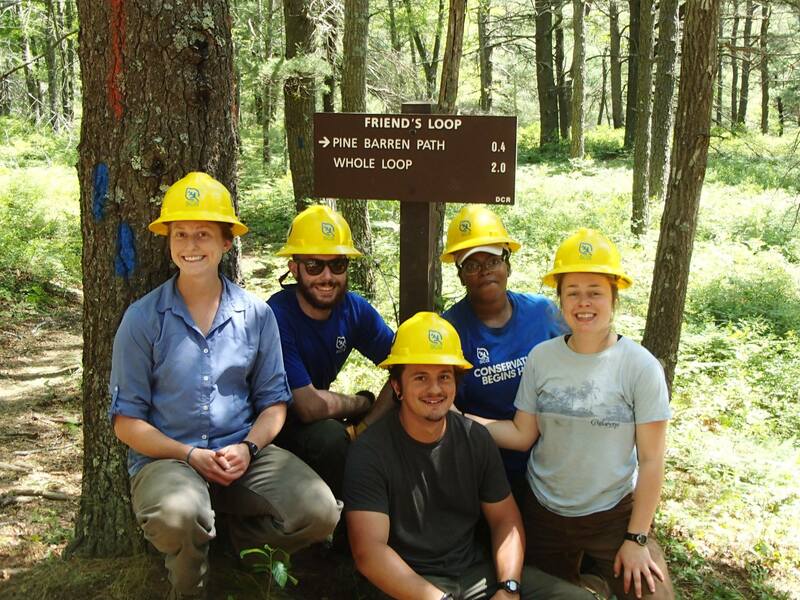 The entire eight miles of the trail from its northern end along the Friends Trail to its southern end at Sasemine Road (off Charge Pond Road) was blazed with blue painted trail markings in 2016 and wooden trail signs were placed along the trail. 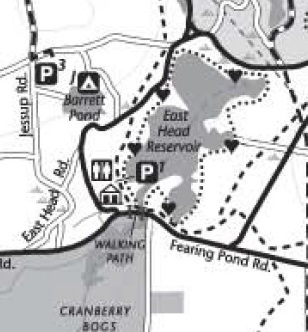 Several miles can be cut from the trail by parking in the fourth parking lot along Cuttersfield Road (easiest way to get there is to follow the signs to Camp Squanto- the trail head is in the fourth parking lot along Cuttersfield Road, the first after the big curve). From Cuttersfield Road, the trail heads north through the wide open fields (the Cutter fields) for about two-thirds of a mile until it hits Webster Springs Road. Then it heads west (left) along Webster Springs Road for about one half of a mile, until it makes a right turn at the trail sign into the forest and heads north. 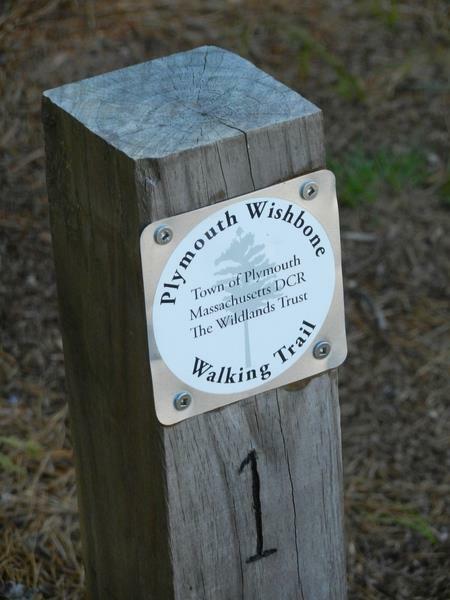 16 additional trail signs were produced by the DCR in 2016 to make locating the trail heads easier and installation along the Pine Barrens Path is complete. A connection from the Friends Trail is evident on the new map and the entrance has been marked with a sign. Other trails are a bit more challenging to follow for first time visitors. Myles Standish State Forest is large but it is criss-crossed by many forest roads which make figuring out where you are fairly easy. The state's old map (shown) clearly showed the grid of main driveable roads through the park and the many dirt roads accessible to fire emergency vehicles running north-south and east-west. All of the intersections are now marked with red street signs, meaning that when you find one of these paved or dirt roads, you will soon be able to figure out where you are. For those of you who want to join us on a group hike, you can find our event listings online at Meetup.com. We invite you to try one of the weekly "Get the Dogs Out!" walks on Sundays for people with friendly dogs (those without are welcome too) or one of our many other Meetups. 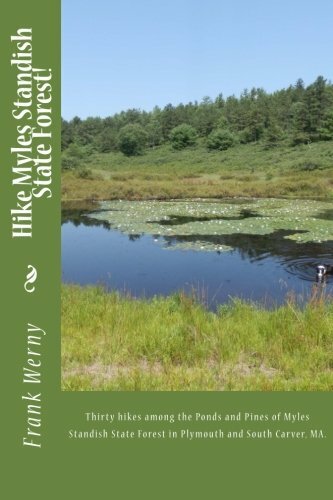 Frank has also written "Hike Plymouth" , which includes color maps and photos and full info on more than 100 hikes in the Plymouth area including eleven of the hikes hikes in Myles Standish State Forest. 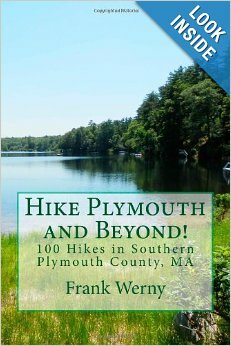 It is in its 4th edition by now and Hike Plymouth is available on Amazon.com or directly from Frank at HikePlymouth.com.